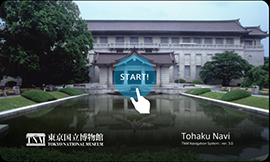 TOKYO NATIONAL MUSEUM - Applications About "TohakuNavi"
“Tohaku Navi” is the official smartphone app for the Tokyo National Museum. It features guided courses for the regular exhibition at the Tokyo National Museum. 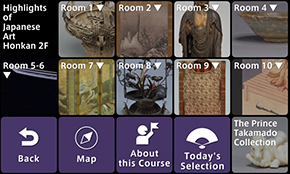 Each course is designed so that it can be played back along with the exhibits within the museum, however the application can be enjoyed anywhere at your leisure. The Android version of “Tohaku Navi” was first released in April, 2012 (Japanese) followed by the iOS Lite version in September, 2013 (Japanese/English). 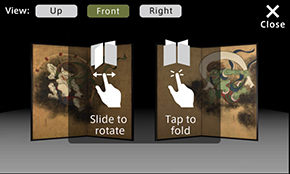 In April 2014, “Tohaku Navi” version 2.0 was released for both Android and iOS each with the same features and contents. 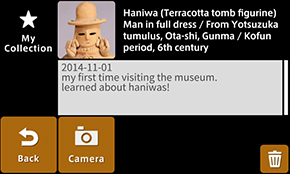 The latest version 3.0 released in October 2014 includes the newly added “Today’s Selection” feature in the “Honkan 2F Highlights of Japanese Art Course (45min)”. 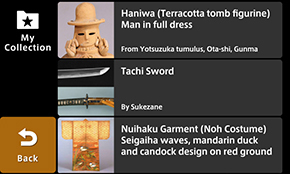 In “Today’s Selection” you can browse images and listen to audio guides of 14 objects recommended by the curators. Objects introduced in “Today’s Selection” will be automatically updated according to changes made in the exhibits at the museum. 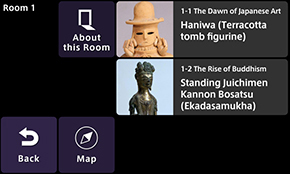 “Honkan 2F Highlights of Japanese Art Course (45min)” supports sensing technologies so that content is automatically played back according to the exhibit room the user is currently located. “Tohaku Navi” is available for free download to your smartphones. Contents are also available in English, so we hope that you will enjoy it! About "Tohaku Navi Joint Research Project"
1. 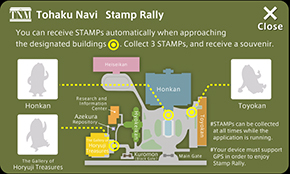 “Tohaku Navi” includes six guided courses for the Tokyo National Museum’s regular exhibition and a stamp rally feature. Users can choose a course depending on how much time they want to spend or their interests. This course is a 30-minute walk around the first floor of the Honkan that features thematic exhibitions that focus on a particular genre, such as sculpture, ceramics and swords. It contains 4 interactive contents. This course is a 45-minute walk around the second floor of the Honkan, or Japanese Gallery. It contains the “Today’s Selection” feature and 4 interactive contents. The Museum Architecture Course is a 30-minute walk around 6 of the museum’s buildings. This course is a 45-minute walk around the Toyokan, or Asian Gallery that features decorative art objects and archaeological objects from China, the Korean peninsula, Southeast Asia, Central Asia, India, Western Asia and Egypt. This course is a 30-minute walk around the Gallery of Horyuji Treasures. This course is a 30-minute walk around the Heiseikan’s Japanese Archaeology Gallery That displays archaeological artifacts from the Paleolithic period, around 40,000 years ago, through to the Edo period. 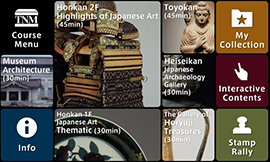 The “Today’s Selection” feature lets you browse images and listen to audio guides of 14 objects recommended by the curators in the “Honkan 2F Highlights of Japanese Art Course (45min)”. Objects introduced in “Today’s Selection” will be automatically updated according to changes made in the exhibits at the museum. This feature also supports both English/Japanese according to your language preference in your smartphone settings. You can choose favorites from Today’s Selection to build your own collection by using the “My Collection” feature. You can also save comments and photos. * “My Collection” does not support Emoji characters. 4. 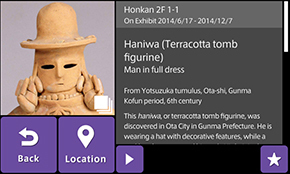 In “Honkan 2F Highlights of Japanese Art Course” course when users enter the respective exhibit rooms introduced in this course, content is automatically played back. Automatic content playback is also featured at the exhibit case in Room 10 to support automatic playback per exhibit work in the case. Content is automatically played back when users enter respective exhibit rooms. 5. 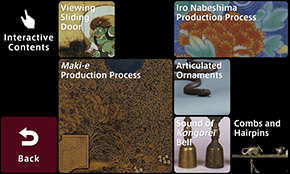 “Honkan 1F Japanese Art Thematic Course(30min)” and “Honkan 2F Highlights of Japanese Art Course(45min)” includes interactive contents, such as the introduction to the maki-e production process and interactive viewer for the Wind God and Thunder God folding screen painting. You can enjoy the interactive contents by selecting the “Interactive Contents” icon on the Course Menu. 6. The app includes a stamp rally feature where users can automatically collect digital stamps according to their location. 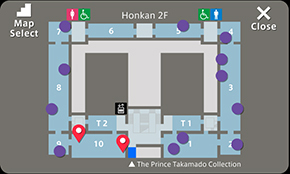 Digital stamps can be collected at 3 locations in the museum in front of the following buildings: Honkan, Toyokan, and Gallery of Horyuji Treasures. There are two types of button badges. Badge designs change every month. 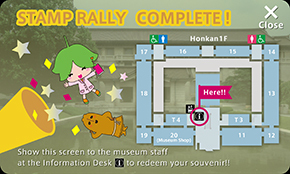 * You can redeem your badge at the Information Desk in the Honkan by showing the "Stamp Rally" screen on your device. * You can receive only 1 badge at a time. * The "Stamp Rally" feature requires GPS support. Some features may be limited on your device. The Stamp Rally feature requires GPS support. Supported by: Sony Computer Science Laboratories, Inc.
"Tohaku Navi" was specially funded by the Toshiba International Foundation.